A new scholarship is being offered through Kansas State University’s Division of Continuing Education for distance education students involved in the military. The Allan D. Sicat Scholarship will provide $1,500, beginning with the fall 2013 semester, to a selected active duty or veteran applicant who meets the requirements. 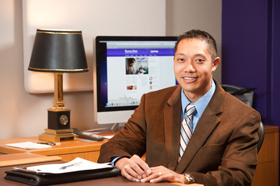 The donor of the scholarship, Allan D. Sicat, is the president of Carousel Designs in Douglasville, Ga., and was the Division of Continuing Education’s first distinguished K-State alumni fellow in 2011. After graduating from the Military Academy at West Point and serving as a U.S. Army officer, Sicat completed the online master’s degree in engineering management from Kansas State University in 2003. Sicat developed an affinity for the university while completing his degree and as a result, felt a strong desire to give back. He approached the division last summer, wanting to set up a scholarship fund and has committed to provide a $1,500 scholarship each year for the next five years. Stewart says the division has been working for some time to increase scholarship funds for distance education students. These students often will not qualify for traditional scholarships available from the university because they do not carry the required 12 credit hours per term. The application for the Allan D. Sicat Scholarship for the fall 2013 term is due April 1. In addition to the application, students must have a 3.0 GPA and submit a resume and a 500-word essay describing their plans to pursue a college degree to further their military or professional career. More information about the Allan D. Sicat Scholarship is available at http://www.dce.k-state.edu/students/services/scholarships/sicat-scholarship/. View all available financial aid and scholarship opportunities for Kansas State University distance education students at http://www.dce.k-state.edu/students/services/financial-aid.